Canon has announced an addition to its high-quality compact photo printer line-up - the Pixma mini320 Compact Photo Printer. This compact photo printer will allow consumers to bring to life those images captured at important moments, such as a wedding or a child's first day of school, in an easy-to-use and affordable fashion. Canon has combined breakthrough printing, scanning and copying technologies with quality, speed and ease-of-use features, putting them all into sleek and sophisticated packages to deliver three new photo All-in-One (AIO) printers - the Canon Pixma MP970, MP610 and MP520 Photo All-in-One Printers. These quality rich features have been designed in the most elegant packages to fit into modern home or office decors, while even saving space in a dorm room. 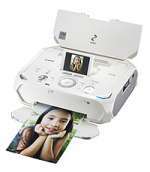 New and returning Canon printing, scanning and copy technologies provide users with a home photo lab that produces outstanding image quality, while also being easy to use. 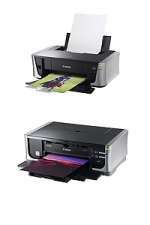 For the at-home or small office user who wants to combine high-quality and fast photo printing with excellent text printing, the Pixma iP4500 Photo Printer and Pixma iP3500 Photo Printer, announced today by Canon U.S.A., Inc., are two great choices. The Pixma iP4500 Photo Printer boasts high-resolution, fast photo printing speeds and five individual ink tanks to deliver professional performance. 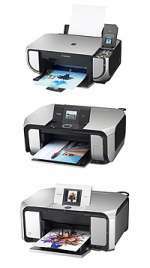 The Pixma iP3500 Photo Printer offers four individual ink tanks and a 4-inch x 6-inch photo lab quality borderless print in less than approximately 50 seconds, all at a value price point. It’s about forethought, professional specifications and the seamless integration of cutting-edge technology: The Olympus E-510 delivers nothing short of impeccable performance. This successor to the E-500 gives photographers a better way to frame compositions since – unlike most D-SLRs – it boasts Live Preview capability on its 2.5”/6.4cm HyperCrystal LCD. Olympus proves itself once again as a technology leader with this camera’s built-in image stabiliser. As it is incorporated directly into the body, there’s no need for the costly inclusion of a stabiliser in each lens. Experience dramatically improved shooting results with a new image processing engine that offers excellent noise performance – thus bringing picture quality to a whole new level. The all-new 10.1 megapixel, APS-H size CMOS sensor which is designed and manufactured by Canon, is the most light-sensitive and innovative sensor that Canon has developed to date. It features a new microlens array and a more efficient pixel structure for ultra-low noise, resulting in exceptional image quality and an amazing ISO range of 100 to 3200 with extensions to ISO 50 and a highly usable ISO 6400. 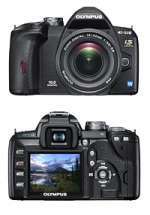 Building on the success of the CoolPix Style Series of digital cameras, Nikon is pleased to introduce the S200 and S500. Boasting 7.1 megapixels, a 3x Zoom-Nikkor glass lens, VR Image Stabilization technologies, and sleek metal bodies, these cameras exude high performance and exquisite design. Both cameras feature a classic camera design as the lens extends from the camera's body when the cameras are turned on; the S200 is constructed from brushed aluminum and the S500 from stainless steel. Canon's EOS Digital Rebel XT model - the camera that set all time sales records for digital SLRs of any persuasion now takes its place alongside of the newest member of the irrepressible Rebel clan: the 10.1 megapixel EOS Digital Rebel XTi SLR camera. For 16 years, the Rebel brand has stood for advanced, sophisticated and easy-to-use. The new Canon EOS Digital Rebel XTi camera continues that legacy, taking discriminating photo hobbyists, enthusiasts, advanced amateurs and SLR aficionados to places digital dreams are made of...and more economically than ever before. The DX Nikkor concept of ultra wide-angle lenses for use with DX-format digital SLRs has been extended with the announcement of new model - the AF-S DX Zoom-Nikkor 17-55m f/2.8G IF-ED. 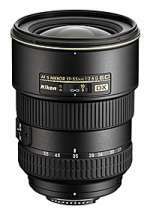 The AF-S DX Zoom- Nikkor 17-55mm f/2.8 G IF-ED is a flexible, wide-angle zoom designed for general photography with a picture angle equivalent to 25.5-82.5mm in 135 format. The DX optical design enables a high 3.2 zoom ratio with a fast aperture of f/2.8, without sacrificing performance or handling. Incorporating three ED (Extra-low Dispersion) glass elements and three aspherical (for reduced distortion) elements in the 14-element, 10-group construction. Digital photographers looking for a top-of-the line compact digital camera can now take advantage of the latest in Fujifilm's F-Series digital cameras with the 12-Megapixel FinePix F50fd. 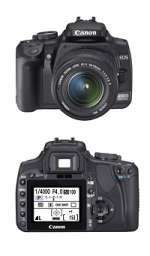 Following a long line of award winning F-Series models, the FinePix F50fd, like the FinePix F31fd and F40fd before it, offers consumers a super-compact digital camera that takes beautiful shots with the most advanced features and technology available, so that missing great shots is not an option. FujiFilm today announced the launch of the eight-MegaPixel FinePix F480, the latest model in Fujifilm's F-Series digital camera lineup and successor to the F470. 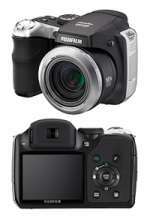 No bigger than a deck of playing cards, the F480 is aimed at entry level photographers looking for function and form. 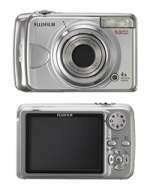 It carries an 8.2 MegaPixel CCD sensor along with a digital signal processor for noise reduction. 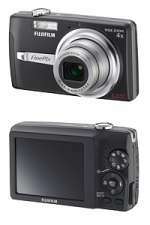 This CCD and processor combination ensures that pictures taken with the FinePix F480 are colorful, clear and crisp. 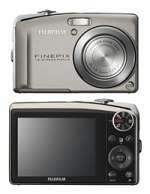 Fujifilm today announced the launch of the nine-MegaPixel FinePix A920. Designed specifically for the first-time digital camera buyer and consumers seeking an affordable, easy-to-operate upgrade to their current digital camera, Fujifilm's FinePix A920 is loaded with features usually reserved for more advanced models. 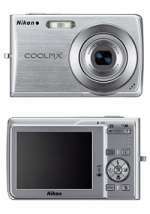 The camera incorporates Fujifilm's signature Super CCD sensor technology, a 4.0x optical zoom lens and features a 2.7" LCD. Fujifilm is bringing the wide-angle, long zoom technology to the consumer market with today's introduction of the FinePix S8000fd. The 8-MegaPixel, SLR-styled camera features one of the largest optical zooms on a fixed-lens camera in the industry, and introduces Fujifilm's latest 'Dual Image Stabilization,' plus ISO settings of up to ISO6400 (at 50% resolution) – all features you would expect in a high-end digital camera, but at a price point consumers can afford. Nikon now offers two new DVDs presented by Nikon School that show anyone how easy it is to take great pictures with Nikon digital SLR cameras. Hosted by award-winning National Geographic Traveler photographer Bob Krist, the DVDs take SLR camera owners on an entertaining and informative journey from the very basics of their Nikon digital SLR camera to advanced shooting situations where they can unlock their camera's potential. The Kodak Easyshare C513 Camera is an entry-level camera designed to produce high-quality images no matter how experienced the photographer may be. The camera is based on the new Kodak KAC-05011 CMOS image sensor, which delivers the image quality and overall performance customers have come to expect from Kodak’s Easyshare line of digital cameras while taking advantage of the power, integration and cost benefits associated with CMOS technology. Sigma Corporation is pleased to announce the launch of two new HSM lenses for Nikon, 18-50mm F3.5-5.6 DC HSM and 55-200mm F4-5.6 DC HSM, and also two new flash units, EF-530 DG ST and EF-530 DG SUPER.